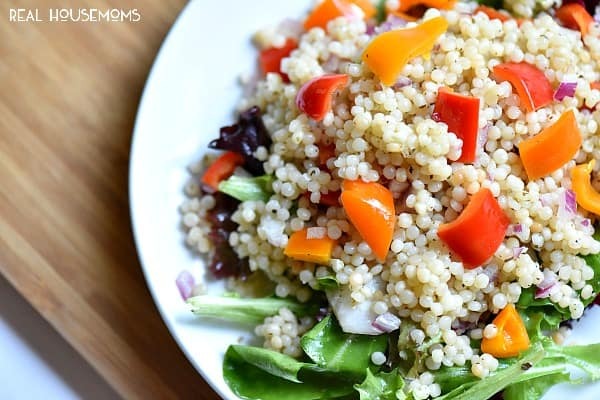 PEARL COUSCOUS SALAD tastes out of this world good. I had it on a flight and had to make it at home for a delicious lunch. I usually make a big batch to have through out the week! Early in the fall I was super lucky to get out of town for a girls’ weekend with some friends from college. We met in San Francisco. They’re the type of friends that we don’t get to talk often but as soon as we’re together it’s like we hung out the day before. When we get together without kids and husbands, we turn into kids again and have a blast! I think it’s so important to be able to act like a kid every now and then to blow off steam and make sure you don’t start to take yourself too seriously! On the flight out I was crazy lucky and scored an upgrade to first class!!!!!! It was so nice to be able to sit back and read on the flight, sip on a glass of wine and have a couscous salad for lunch! That Pearl Couscous Salad was so good I was dreaming about it when I got home. It was just perfect. It didn’t feel heavy and had some really fantastic flavors. 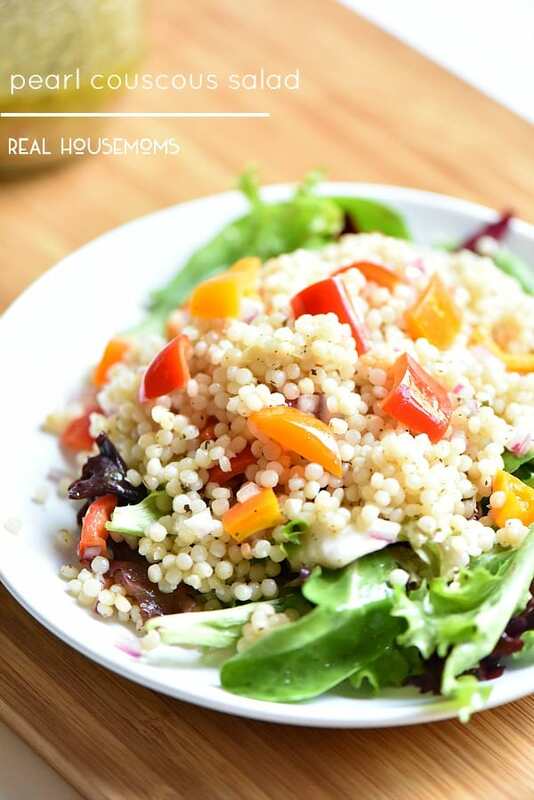 The softness of the couscous with the crisp bell peppers all on top of the leafy greens was just amazing. I knew I had to make it so I did when I got home. It made the best lunch and I started to make big batches to keep in the fridge when I made it to have through out the week. It comes together in no time and it’s a great break from sandwiches and regular salads all the time. I’m telling you once you make it you will be jumping up and down and you will want it all the time! spoon out the couscous mixture over top of the salad and serve.